Beef production has underpinned Brazil’s economic ascendance into global commodity markets, accounting for 15.5% of global production in 2013 (1). Brazilian exports are considered highly competitive, mainly because grazed pastures are an important part of beef production, and feeding costs are low compared to feedlot systems (2). The environmental consequences of the sector’s expansion have also been widely discussed, particularly the perceived nexus of extensive production, land use change, deforestation, and the loss of valuable ecosystem services. Historically (1950-1975), deforestation and extensive ranching explained around 86% of growth in production (3). Ranching systems were typically characterised by limited mechanization and low input use, e.g. fertilizer or seeds. Growth was also supported by government research and development programs focussed on the expansion and establishment of agriculture in frontier regions of the Brazilian savannah (Cerrado) and parts of the Amazon. Ranchers were also allowed to clear forests to secure properties rights. 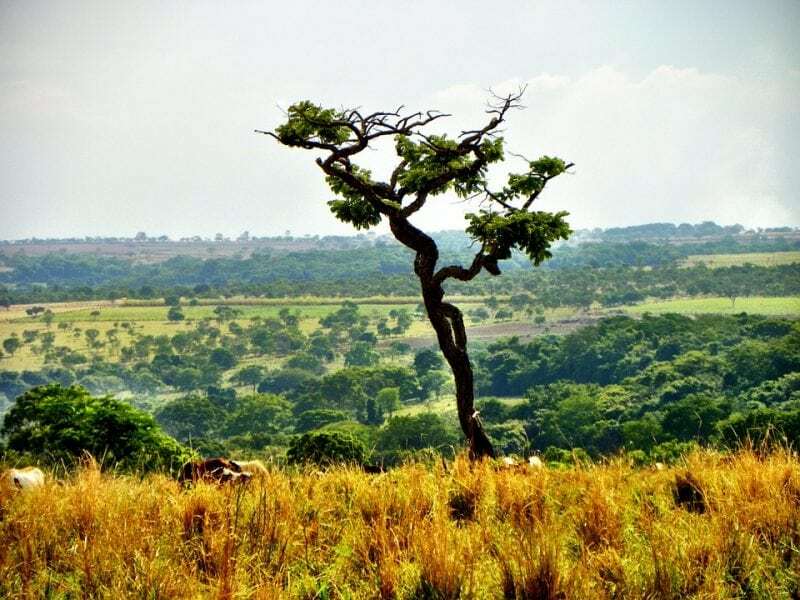 Development of the Cerrado was a step-change accelerating Brazil’s global market ascendance (4). From 1975 the productive potential of the region became clearer as producers reaped benefits from research on improved animal performance, and used better-adapted Brachiariagrasses. Beef cattle productivity, measured in kilograms of carcass per hectare (kg-c.ha-1), increased from 22.8 kg-c.ha-1in 1995 to 43.38 kg-c.ha-1 in 2006. But despite this step-change, national productivity remains low compared to a potential carrying capacity more than double the current value. This is partially explained by pasture degradation: grasses presenting low dry matter productivity insufficient for animal nutritional requirements. The story of initial extensive and subsequent progressive intensification is one of the multiple explanatory causes of observed and documented deforestation trends. Peaking in 2004, annual deforestation rates have since decreased significantly, and are currently around 70% lower than the 1995-2005 average. Pasture area decreased from 214 million hectares (Mha) to 196 Mha over the period 1995-2006, while cattle numbers continued to increase. Deforestation in all Brazilian biomes has fallen to their lowest rate since satellite monitoring began (5). This means that Brazil has already significantly reduced emissions from deforestation (-82% from 2004 levels in 2014), while those from agriculture and the energy sector continue to grow (+7.4% and +35.9 respectively 2005-12); both sectors overtaking deforestation as the largest sources of emissions. This apparent decoupling of agricultural output and deforestation lay behind the formulation of Brazil’s Nationally Determined Contribution (NDC) offered at COP21 in Paris in 2016. The NDC is noteworthy in focussing on emissions from deforestation control and land use change, offering to reduce greenhouse gas (GHG) emissions by 37% below 2005 levels by 2025 and 43% by 2030, partly achieved by a target that includes achievement of zero deforestation in the Amazon by 2030. The NDC implies that Brazil is betting on a form of continued sustainable intensification of agriculture, reconciling an upward trend in livestock production to meet growing demand, with reduced emissions. How might this be possible? The answer lies in a land sparing strategy that targets extensive restoration of degraded pastures using chemical and mechanical soil treatment and applying seeds, nutrients, and fertilizer. The question is how much restoration should be undertaken to achieve the zero deforestation target? This was a question posed by the Brazilian Ministry of Agriculture prior to the NDC announcement. Our analysis set out to demonstrate the potential livestock contribution to the NDC, using bioeconomic modeling parameterized for the Amazon, Cerrado, and the Atlantic Forest biomes, which account for around 90% of Brazilian livestock production. In essence, the model identified an optimized pasture restoration pathway subject to the aforementioned nexus of constraints. The model is based on a whole cycle beef production farm system accounting for herd dynamics, financial resources, feed budgeting, land use, pasture recovery dynamics, crops and soil carbon stocks. The analysis suggests that 16.20 to 18.42 Mha of the restoration of degraded pastures is necessary to meet beef demand and the zero deforestation target by 2030. 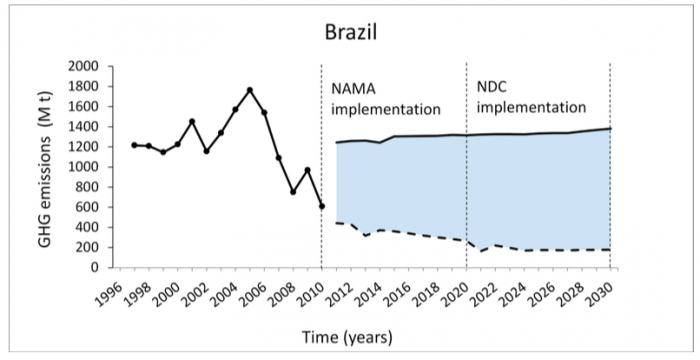 The figure is equivalent to restoring around 10% of Brazilian pasturelands, estimated as 160 to 214 Mha.The restoration target would take place over the decade 2020-30 and would have to be complemented by increased adoption of animal efficiency measures, e.g. feedlots and on-pasture supplementation. Our study suggests around US$ 0.44 billion is required annually to meet the 18.4 Mha restoration target. To support the restoration plan the Brazilian government has introduced a targetted support program allocating low-interest credit for low carbon agriculture, the Agricultura de Baixo Carbono(ABC) – Low Carbon Agriculture program (7). The ABC program offers credit to farmers adopting mitigation technologies, including pasture restoration. The available ABC budget is around US$2 billion, well in excess of the estimated US$ 0.44 billion requirements. Without the NDC we estimate that GHG emissions would average 1130 Megatonnes of CO2equivalent per year (Mt CO2e·yr− 1) until 2030. NDC implementation could reduce this to 165 Mt CO2e·yr− 1; equivalent to 80% reduction of livestock emissions (85% in the Amazon and 43% in the Cerrado). Brazil’s NDC is a bold statement of its scientific and intuitional commitment to reconciling sustainability challenges via sustainable agricultural intensification. Indeed, it is arguably the only globally relevant demonstration of the rhetoric to be found. Our analysis points to the feasibility of the approach pending the role of complementary policies on deforestation and farm support. The intensification route by pasture restoration applies elsewhere in Latin America (e.g. Colombia), and potentially in sub-Saharan Africa. These findings are described in the article entitled The role of agricultural intensification in Brazil’s Nationally Determined Contribution on emissions mitigation. The study was requested by the Brazilian Ministry of Agriculture prior to the NDC announcement at COP21 and recently published in the journal Agricultural Systems. This work was conducted by Rafael De Oliviera Silva and Dominic Moran from the University of Edinburgh, and Luis Gustavo Barioni and Giampaolo Queiroz Pellegrino from Embrapa Agriculture Informatics. FAO, The Statistics Division of the FAO (Food and Agriculture Organization of the United Nations) (2015), (available at http://www.fao.org/faostat/en/. C. G. S. Pedreira, L. S. Silva, M. P. Alonso, Use of grazed pastures in the Brazilian livestock industry: a brief overview. Forages Warm Clim., 7 (2015). G. B. Martha, E. Alves, E. Contini, Land-saving approaches and beef production growth in Brazil. Agric. Syst. 110, 173–177 (2012). The Economist, The miracle of the Cerrado; Brazilian agriculture. Econ. VO – 396 (2010), p. 59. D. M. Lapola et al., Pervasive transition of the Brazilian land-use system. Nat. Clim. Chang. 4, 27–35 (2014). INPE, Annual deforestation rates in the Brazilian Amazon – PRODES project (2017), (available at . G. B. Mozzer, in CLIMATE CHANGE IN BRAZIL economic, social and regulatory aspects, R. Seroa da Motta, Ed. (IPEA, Brasília, DF, 2011; https://www.ipea.gov.br/agencia/images/stories/PDFs/livros/livros/livro_climatechange_ingles.pdf#page=108), p. 358. Dominic Moran is Professor of Agricultural and Resource Economics. He joined the University of Edinburgh in 2018 after a period of 18 years with SRUC, prior to which he was a government economist and in private consulting. His research focuses on applying economics to environmental management and the development of interdisciplinary approaches to resource allocation problems in agriculture and global food security. Most recently, his work has focused on the challenges of reducing greenhouse gas emissions from agriculture and food supply chains, and the problem of antimicrobial use and resistance in agriculture. Dominic has worked in over 30 countries and has published more than 100 refereed journal papers. He has been in continuous receipt of funding from EU, ESRC, NERC or BBSRC since 2000 for his research on climate change and agriculture, and has supervised 20 Ph.D. students.